Bronze relief portrait medallion. 1906. 60 mm diameter. The 19th Century Rare Book & Photograph Shop recently announced the sale of a massive 750-piece collection dedicated to the life and works of the father of modern psychology and psychoanalysis, Sigmund Freud. The collection includes a comprehensive representation of Freud’s published works from the 1880s to the 1940s. Freud was is one of the field’s most prolific authors, and many of the books in this collection are in their original printed wrappers. A run of 22 rare offprints--galley proofs, presentation and association copies--is believed to be the largest such collection in private hands. Also among the items are etchings, lithographs, bronze medallions, and photographs of Freud, many of which are signed by the doctor. 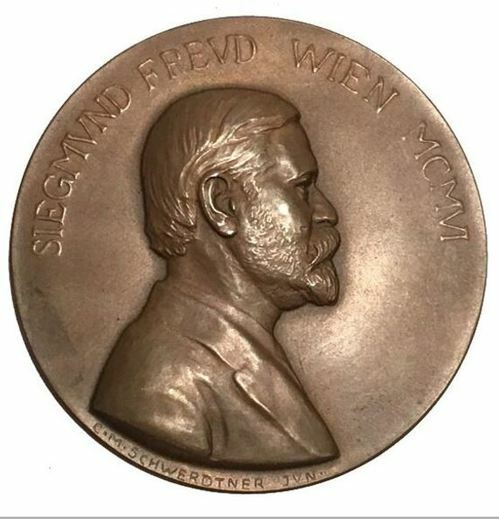 In addition to manuscripts, correpondance, and psychoanalytic journals, are nearly 80 books that Freud had donated to the Vienna Psychoanalytical Society, remarkable because the Nazis dissolved the society and destroyed the library in 1938. This cache was secretly saved. The collection includes a comprehensive representation of Freud's published works from the 1880s to the 1940s. Freud was is one of the field's most prolific authors, and many of the books in this collection are in their original printed wrappers. A run of 22 rare offprints--galley proofs, presentation and association copies--is believed to be the largest such collection in private hands.